San Jose, Calif., Singapore and Santa Clara, Calif., USA - August 13, 2014 - Avago Technologies Limited and Intel Corporation today announced the signing of a definitive agreement for Intel to acquire LSI's Axxia Networking Business and related assets for USD650 million in cash. LSI's Axxia Networking Business is being divested from Avago following the recent completion of Avago's acquisition of LSI. The Axxia Networking Business generated revenues of USD113 million in calendar 2013 and employs approximately 650 people. Avago Technologies Limited and Intel Corporation today announced the signing of a definitive agreement for Intel to acquire LSI's Axxia Networking Business and related assets for $650 million in cash. The Axxia® Network Accelerator PCIe® cards provide inline and co-processor acceleration of security processing, content processing, and realtime services such as application recognition, network packet capture and network performance monitoring. The transaction, which has been approved by the boards of directors for both Avago and Intel, is expected to close in the fourth calendar quarter of 2014 upon satisfaction of government approvals and customary closing conditions. LSI's Axxia Networking Business is being divested from Avago following the recent completion of Avago's acquisition of LSI. The Axxia Networking Business generated revenues of $113 million in calendar 2013 and employs approximately 650 people. Avago Technologies Limited is a leading designer, developer and global supplier of a broad range of analog semiconductor devices with a focus on III-V based products and complex digital and mixed signal CMOS based devices. 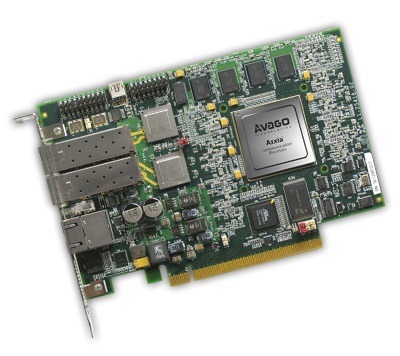 Avago's product portfolio is extensive and includes thousands of products in four primary target markets: enterprise storage, wired infrastructure, wireless communications and industrial & other. Intel (NASDAQ: INTC) is a world leader in computing innovation. The company designs and builds the essential technologies that serve as the foundation for the world's computing devices. As a leader in corporate responsibility and sustainability, Intel also manufactures the world's first commercially available "conflict-free" microprocessors.